It is easy to say that many of the promotional opportunities we see from the biodiesel industry wouldn’t be possible without the Biodiesel Foundation. 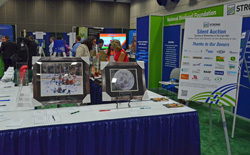 During the 2014 National Biodiesel Conference the foundation was hard at work to raise money in order to increase awareness. Beth Calabotta, Vice President of the Biodiesel Foundation, shared with Chuck in an interview that their goal is to work to promote biodiesel education, infrastructure and awareness. The Foundation has a very wide variety of people on it’s board, including producers, farmers and many others involved and passionate about the industry. Those interested in doing their part and contributing to the Biodiesel Foundation can do so at www.BiodieselFoundation.org.